Welcome to our exciting news service. We anticipate emailing a selection of stories about three times a month. To receive this service by regularly by email, please join MyAnglican or use your existing membership to subscribe. Feel free to share or forward email addresses of friends, family and parishioners if you think they would like to get news. Please be assured that contact information will NEVER be shared with other parties/marketers. 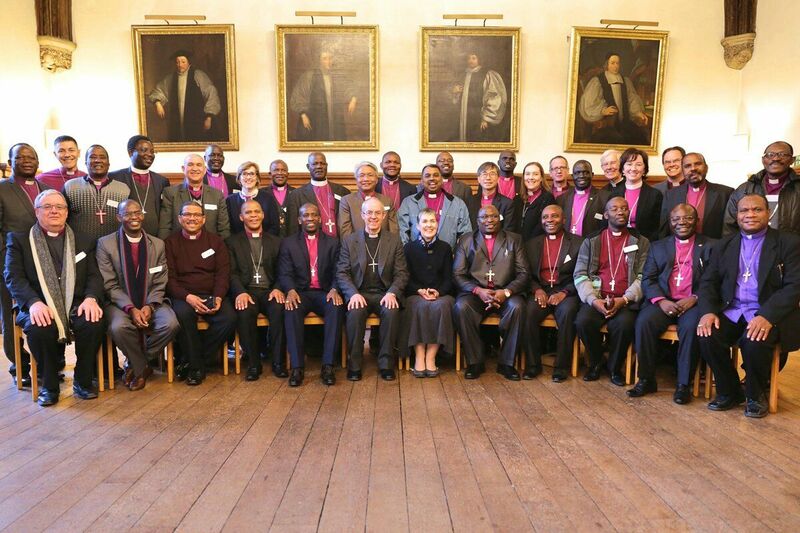 As Bishops of the Anglican Church of Southern Africa (ACSA), we met in Synod in Benoni from Monday 19th until Friday 23rd February 2018. The full bench of Bishops was present, as well as the Vicar General of the Diocese of Umzimvubu. We represent Anglicans from Mozambique, Angola, Namibia, St Helena, Swaziland, Lesotho and South Africa. Our meeting started with an “Eco-Retreat”, and took place within a rhythm of prayer, worship and fellowship. During our time together we shared at a personal level and debated issues facing the church, local communities and our various countries. In the interests of the environment, we had our first “paperless” Synod of Bishops, in which documents were distributed electronically. Our “Eco-Retreat” was on the theme of water – bearing in mind the water crisis facing the Western Cape and some other parts of Southern Africa. Water is life, and we need to respect and use it as a gift from God for all. It is also a powerful symbol of God’s gift of the Holy Spirit. Jesus said, “Those who drink of the water that I will give them will never be thirsty. The water that I will give will become in them a spring of water gushing up to eternal life” (John 4:14). The Synod of Bishops welcomed the resignation of Jacob Zuma and the election of Cyril Ramaphosa as President of South Africa. What happens in South Africa affects all the countries of ACSA. We are aware of a fresh spirit of freedom and hope in South Africa. We also welcome reports of progress and reconciliation in many of our countries. We pledge our prayers, and those of our people, for all who are in positions of power and authority in our countries. In the name of God we urge them to lead with an attitude of humble service, remembering especially those who are weak, vulnerable and in need. We urge our governments to prepare national budgets that are pro-poor. We call for corruption to be exposed and justice to be done wherever there has been abuse of power or privilege. We discussed the process of preparing for Bishops to retire and how to plan smooth transitions to new Bishops. We believe that it is important to do this is a way that is orderly and best serves the life, ministry and mission of ACSA. We said farewell to Bishop Richard Fenwick of St Helena and Bishop Bethlehem Nopece of Port Elizabeth, who will retire before and next Synod of Bishops meeting. We rejoiced in the planned consecration and enthronement of Moses Thozamile Madywabe as Bishop of Khahlamba in the Eastern Cape on Saturday 24th February. Our love and prayers are with him, his family and the Diocese as this new ministry begins. The Anglican Prayer Book Revision Process – “Under African Skies”. We recognised that there is a great deal of work still to be done here, and commit ourselves to an ongoing process of liturgical revision for worship that is Anglican, contextual and open to the leading of the Holy Spirit. A Provincial Liturgical consultation is being planned, in which feedback will be received from Dioceses and new work will be identified. Revised Collects for the three year cycle of Sunday readings have been completed, and are receiving positive responses. We welcomed progress on a number of projects, including the de-consecration of a church; a Zulu hymnbook with music; and the blessing and use of holy oils. After receiving advice from our Canon lawyers, we agreed on the process required to transform Angola from a Missionary Diocese to a fully fledged Diocese of ACSA. We also considered the best way forward for establishing a Missionary Diocese in Niassa. 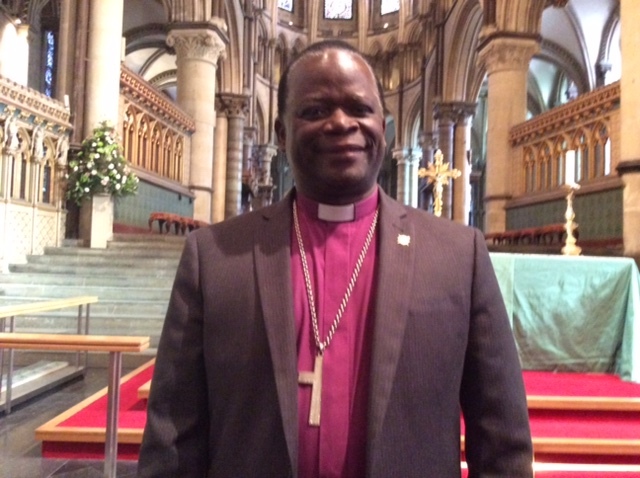 In addition we began to consider an application for a Suffragan Bishop from the Diocese of Namibia. We were introduced to the work of the Anglican Communion Safe Church Commission, which gives “guidelines to enhance the safety of all persons especially children, young people and vulnerable adults, within the provinces of the Anglican Communion”. 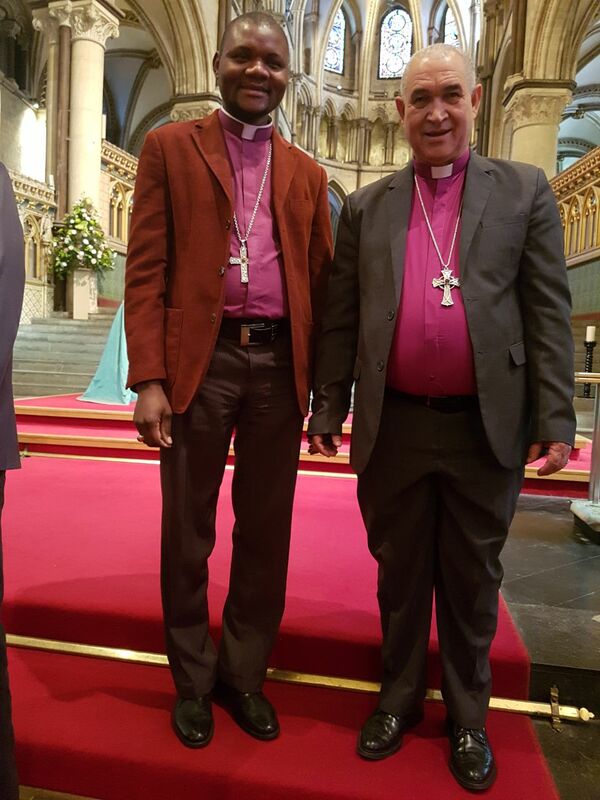 It includes a Charter for the safety of people within the churches of the Anglican Communion. We agreed that this will be a standing agenda item for Synod of Bishops. We are deeply concerned for those who have experienced abuse in the church and want to set things right. HOPE Africa led us in a Gender Sensitisation Workshop, where we heard the deeply disturbing story of a young woman who was a victim of abuse and human trafficking. We were challenged to think critically about our attitudes towards relationships between men and women, and patriarchy within the church and society. We acknowledge that the church has sometimes been complicit in failing to deal with abuse, and commit ourselves anew to intentional and scriptural prophetic, teaching and caring ministries in this regard. Rev Jeremy Jobling and Rev Dorcas Mabitsela presented the Alpha course to us – showing how it can be used to introduce people to God through food, talks about out faith and discussion groups. We were given a full set of resources for training and running Alpha courses. We did an experiential session on Prayer from Youth Alpha – and found that it was not that difficult to put ourselves into the shoes of teenagers! We look forward to encouraging the use of Alpha in our Dioceses. 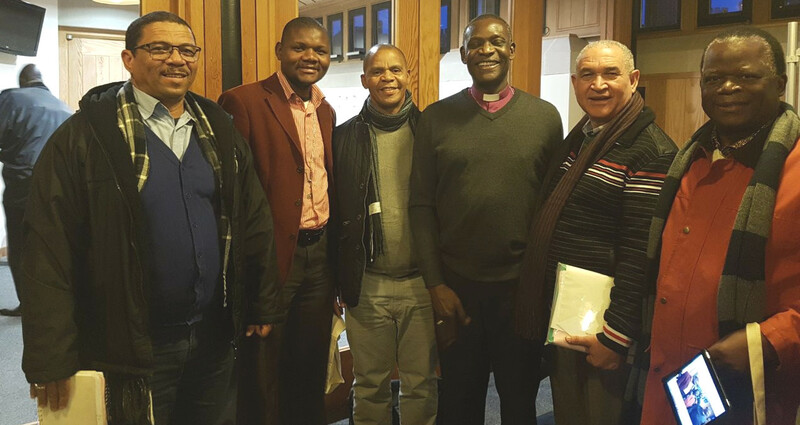 We were encouraged to hear of developments in ACSA’s response to the Anglican Communion’s International Season of Intentional Discipleship and Disciple-Making. Through Growing the Church (GtC) discipleship training teams are being equipped around the Province using the LEAD Programme – Leadership for Evangelism and Disciple-Making. These teams are starting to train disciple-makers in their Dioceses. We welcomed the work of the Anglican Communion’s Discipleship Group, under the banner of “Living and Sharing Jesus-Shaped Life”. We welcomed a progress report on planning and preparations for the next Anglicans Ablaze Conference: 3rd to 6th October 2018 at the City Hill Auditorium, Hillcrest, in the Diocese of Natal. The theme is “Living a Jesus-Shaped Life”. Registrations are open and all the information is available at www.anglicansablaze.org . We noted that there is enormous excitement building up in many parts of the Province. This year we are hoping to have 3,000 people attending. We received an update on MyAnglican, the Church Management System which has been adopted by Provincial Synod. As all our Dioceses and churches register with MyAnglican and start to use it, we will find ourselves being able to keep records, communicate and plan more effectively. Archbishop Thabo encouraged us all to appoint “champions” who have IT skills, to take this work forward in our Dioceses. Dr Sandile Buthelezi of the South African National Aids Council (SANAC) addressed us on their response to the HIV/AIDS pandemic, Tuberculosis and Sexually Transmitted Infections. 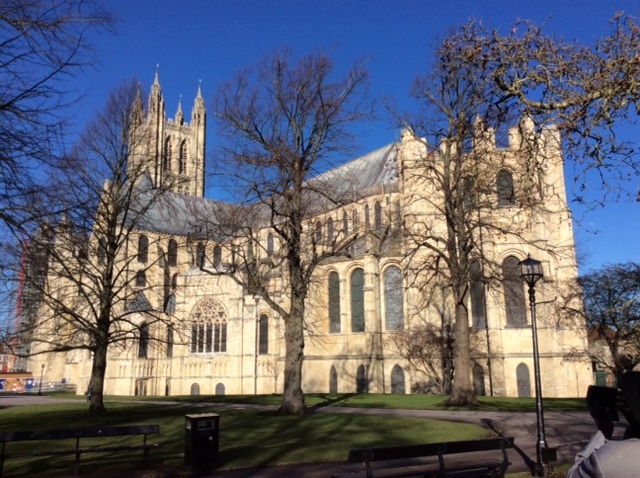 We were encouraged to hear that they plan to work closely with churches once again. It is clear to us that a lot of work still needs to be done in order to address these issues effectively in Southern Africa. We participated in a workshop on Sustainable Development led by a team of Anglican leaders from various parts of Africa. We were reminded of important financial, property, resource and personnel management systems that need to be in place to support the mission and ministry of the church. We heard about income generating projects in some Dioceses, and reflected on how we can be more effective in this area. We also learnt more about the Peer Mentoring Programme. We discussed the challenges that face us at the College of the Transfiguration (COTT), and need it to survive and thrive as a centre of training for future clergy. Each Diocese has been asked to give a regular monthly donation to COTT this year, over and above paying for any students they may have there. Looking to the future, we received the preliminary report of the Commission that has been established under the chairmanship of Prof Barney Pityana. It is clear that we will need to engage in innovative thinking and deep soul-searching about the future of theological education and ministerial formation in ACSA. We agreed to set aside significant time to do this next time we meet, with the help of a variety of experts in the field. The members of the Archbishop’s Commission on Human Sexuality introduced their work to us. We were assured of the commission’s commitment to engage with the whole church in a spirit of openness, without preconceived outcomes. We workshopped some of the issues together – following the commitment of Lambeth Conference Resolution 1.10 of 1998, to consult and listen to one another. The commission explained to us the process of consultation with Dioceses that they envisage. We wish you, individually and in your communities, a blessed Lent, Passiontide and Easter in fellowship with the God of life and love. The Bishops of the Anglican Church of Southern Africa express their deep concern at the increase in Value-Added Tax in the South African government’s budget. It is distressing to us that the ordinary citizens of South Africa are being called upon through increased VAT to fill the gaps in government finances which are partly a result of massive maladministration and corruption, especially in state-owned enterprises. We urge the South African government, as we have urged all governments in our region, to develop budgets which help the poor, to expose corruption and ensure that those who perpetrate it, whether in the private or public sector, are brought to justice. 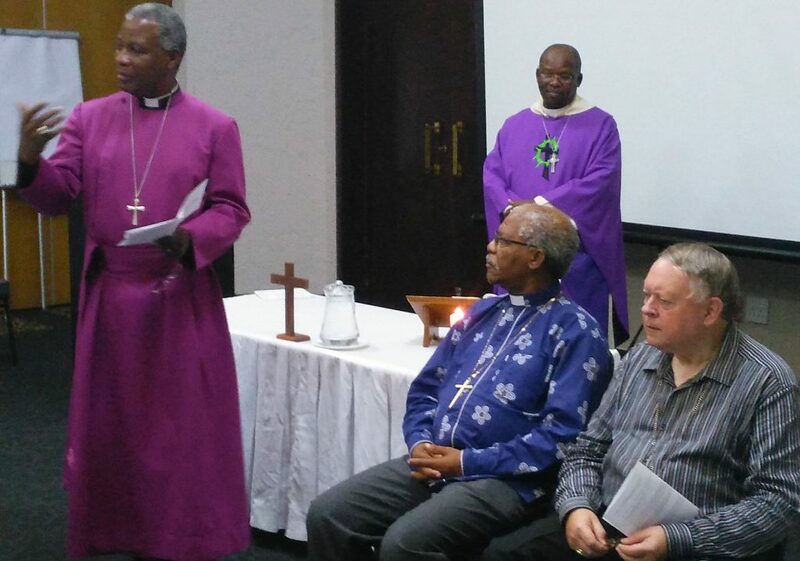 The Bishop of Port Elizabeth, the Right Revd Bethlehem Nopece, sitting left, and the Bishop of St Helena, the Right Revd Richard Fenwick, attended their last meeting of the Synod of Bishops at its February session. Archbishop Thabo Makgoba and the Dean of the Province, the Right Revd Stephen Diseko led the Synod in a farewell liturgy.